I've been drying some of our laundry lately using the latest technology. I saw this on Facebook, and I thought it was fun. I wanted a clothesline when we lived in our first house because the neighbor across the street had one, and it reminded me of how much I love the smell of freshly dried clothes. My mom used a clothesline a lot when I was growing up. But, I never got one while we lived there. I would have been quite convenient since the washer and dryer were in a little room that opened to the backyard, and the garage. Then in Wisconsin, my laundry room was in the basement, and I really didn't give the clothesline too much thought, so it has taken me until this summer to start drying some of the clothes outside in the sunshine. There really is nothing like freshly washed and line dried sheets! Jeffrey is planning to put a real clothesline in behind the awesome garden he built me. He has the post built but still needs to put it in the ground and add the line. So, in the meantime, I ordered some of these portable clotheslines, and we have one strung between the shed and the garden so I've been using that. I can only dry one king-size sheet at a time, but they dry pretty quickly in the sunshine. It's been working well for shirts and shorts. To dry several at a time, I put them on plastic hangers (the ones we get at Kohl's when we shop there) and use the notches in the line to hang the hangers so they stay in place on the line. 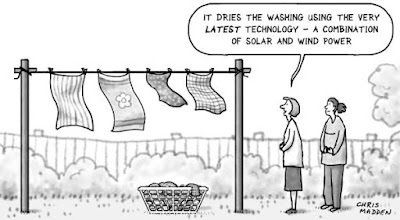 Have you upgraded your laundry technology recently? What Should You Update in Your Home? Is it Too Early for a Fire?